Hair clips are back in stock plus new fabric covered bobby pins! Check out the new packaging using the pen blender tutorial by bliss in a teacup (via poppytalk). Want a pair? Drop me a line! Last Thursday, the Museum of Vancouver hosted a DIY night and invited Got Craft to be a part of it. Let me tell you... if you didn't make it down there, you missed out! It was so much fun! The ladies from Yarn Bombing were on-site with yarn demostrations throughout the evening. There was a mountain of yarn that you can choose and make stuff with. Jackie from Divesin oversaw paper collage workshops which were insanely popular. Opus donated all of the materials that you could possibly need to make the perfect take home wooden panels. Got Craft had a super mini craft fair set up with SamMade, Divesin, Olive and myself (Roxypop). Thank you to the MOV for all of their hard work in putting this event together. Hope to see many more DIY events! In the meantime, stay tuned for more information on 'Fine Craft' vs. DIY on Thursday, March 4th. Earlier this week was spent whipping up these faux desserts for our Indie I Do table display this Saturday. It was the first time where I sat down with a Japanese craft book and tried to decipher its instructions. They look pretty delicious don't they? I'm pretty happy at how they turned out. Thinking of maybe doing a few cake slices to round out the thrifted tea caddy that I am displaying them on. Yummy! After making a scarf for Robert, I wanted one for myself! Something quick, simple, nice and soft. Using one and a quarter skeins of lion's brand thick wool ease yarn in lemon grass, I casted on about 20 stitches and used a simple garter stitch. After a few rows, I added some fancy looking drop stitches. The image above was altered via the polarize application on iphone. The true colour is more of a bold pea green. As part of the DIY @ MOV event on Thursday, January 21, 2010 at the Museum of Vancouver 1100 Chestnut Street, we will be holding a super mini Got Craft fair! The event starts from 7:00pm and ends at 11:00pm. There will be workshops throughout the evening such as button making with Blim, paper collage with Divesin and so much more! Tickets are $15.00 and can be purchased at the door or you can purchase a membership to the Museum for $35 which includes a whole list of bonuses! 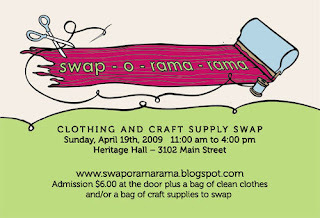 Swap-O-Rama-Rama Vancouver is looking for a new organizer! Swap-O-Rama-Rama (SORR) is a clothing swap and wearable art creation event. The swap begins with a giant collective pile of clothing, the unwanted costumes of all who attend. For a minimal fee and a bag of clothing, everyone is welcome to dive in and find their next new / used items from the pile. Take as little or as much clothing from this pile as you like! After you have chosen your new clothes, move on over to a crafting station, where you can cut, sew, glue, paint, silk screen and otherwise renew someone else's rags into your riches. Materials are available through a crafty supply swap that was added to the event and sewing machines were available to help you unleash your well-dressed muse. Or, attend a workshop where you can learn how to modify your re-fashioned finds in unexpected ways. Any useable remainders go to local charities. SORR was born in New York, when artist Wendy Tremayne saw the power of small-scale clothing swaps among friends, and decided to extend it to the community level. These community-based, environmentally-friendly, and fun events were instant hits, and have since been embraced throughout the US. Vancouver textile artist Heather Cameron and the Work Less Party collaborated in September 2006 to first bring this event to Vancouver. In 2009, the event was then passed to the Vancouver Craft Mafia and Got Craft as a joint production. We are currently seeking an organizer or a group to take over this Vancouver event. Organizers will be responsible for producing the entire event including volunteers, workshops, marketing, etc. Any information gathered from past events will be passed on. Interested applicants can leave a comment with your contact information or send an email to info(at)gotcraft(dot)com. Art of Craft - Exuberant and refined craft room from Canada and the Republic of Korea starts tomorrow (January 14) and runs to April 11, 2010 at the Museum of Vancouver. Unity & Diversity: Selected Works - 75 pieces from across Canada recently on display at the 2009 Cheongju International Craft Biennale in the Republic of Korea. By Hand/BC and Yukon - 51 pieces from Canada’s West Coast with a focus on the artists’ creative processes and studio environments. Craft from the Republic of Korea - 47 pieces demonstrating the excellence of traditional and contemporary crafts. In conjunction with this exhibition, the MOV will be hosting a DIY @ MOV event on Thursday, January 21st. More details posted here. Three Bags Full is having their boxing weekend sale this Saturday and Sunday (Jan 9&10)! I have already made a list of what I plan on picking up tomorrow as I assure you that it will be a crazy event! After a pleasant holiday break, the crafting community is back and this event looks like a good one! DIY @ MOV is a night dedicated to celebrating the creativity and community of the growing DIY (do-it-yourself) craft, art and design movement in Vancouver. Materials and workshops for a range of craft activites from paper and paint to yarn will be on-hand and everybody from the craft newbie to seasons creators is encouraged to participate. Love the item that you made? MOV is providing exhibit space for those that believe are worthy for your items to be viewed for several weeks after the event. Not the crafty type!? The event will also have a party vibe with a DJ and music by Vancouver-based indie artist, local food and a bar featuring local brews. For more information, please visit the Museum of Vancouver. I'm a painter inspired by people, so I like to create character portraits with a storybook feel. I tend to paint girls and cute companion critters, though some of my paintings have a bit of a darker edge to them. I also really enjoy making tiny art pendants. Not everyone can afford an original painting, of course, so this is a fun alternative to a print. Plus I really love the idea of my characters being taken out and about in the real world. Oh goodness...so many things! I love to people watch. Vancouver is great city for that. I walk my dogs every day and literally *every* day I see someone who would make a great painting. I'm also really inspired by my fellow artists. It's amazing to see so many people, especially women, representing themselves via the web and doing what they love. Whether it's painting or sewing or making jewelry, it's fantastic to be part of this shift towards more personal, handmade businesses. I've always been creative and enjoyed creating images in one way or another - photography, graphic design etc. But it never occurred to me that becoming a full time artist was even an option until a few years ago. I thought you had to live in a loft in NYC and have a trust fund to have any chance of making a living as an artist; it just wasn't on the menu for a girl like me. It wasn't until I started seeing self-represented artists selling their own work via eBay and Etsy that I allowed myself to consider it. I began taking classes at Emily Carr and never looked back. As cheesy as it sounds, it felt like I had finally stepped into who I was supposed to be. Now I can't imagine myself doing anything else. I'm very impatient so I like to use acrylic paint. It dries quickly, so I can add lots of layers & go over a piece again & again. With oils, you have to let it dry in between and I just don't have the patience for that! I've been painting on wood a lot lately too which has been fun. When I make prints, I love seeing the texture of the wood show up in the detail. My favorite part of crafting is the community. I've met so many wonderful people both online and in person at local craft shows and markets. There's just something about the community that appreciates handmade, from my fellow crafters to my customers, that is helpful and welcoming and just plain awesome! Seriously. I had someone buy couple of prints from my website and she liked them so much that she sent me a thank you gift in the mail. I'm unbelievably lucky. Etsy: This is an obvious one. Between updating my shop, reading the forums & shopping for supplies, I'm on here daily. This Life: I'll often spend 7 or 8 hours straight working on a painting, so I need lots of podcasts to keep my ADHD-addled brain occupied. This American Life is one of my favorites. Bad At Sports: Another podcast focused on the art world, specifically in Chicago, that keeps me entertained. The hosts are so casual that it feels like hanging out with your friends rather than stuffy contemporary art critics. Twitter: I post on Twitter regularly & check in dozens of times a day. I love it because I can stay in touch with people & share things about my day to day life that I wouldn't necessarily write an entire blog post about. I know a lot of people don't get it, but it's been great for me. I follow lots of other artists and local Vancouver folks, so I've been able to find out about all sorts of things that I would have normally missed. Vancouver is Awesome: Speaking of local Vancouver folks, I love this site. From the best noodle bowl in the city to my new favorite off leash dog park, I have discovered a wealth of local Vancouver awesomeness via this site. Make what you love. This is not to be confused with doing what you love because I don't think that's always true. Just because you like to bake pies doesn't mean you want to make 100 pies a day and market a pie business and deal with customers and overhead and taxes. Sometimes turning a passion into a business can drive the passion right out of it. This is why I say make what you love to make. And, of course, promote yourself! It still feels awkward for me, but one of the best things I've done was to join an artist group. We meet every other week to share resources, do goal-setting and practice talking about our own work. It's been really helpful to get feedback in that kind of friendly environment. something that had a statement or point of view whereas craft was more about function. I think that gap is closing as crafters become more interested in expressing themselves and experimenting rather than doing it "right". I consider myself both an artist and a crafter. I love to paint, but I really want my work to be accessible to everyone; I'm thrilled to see my girls on magnets or pendants, and not just hung on the wall. To kick off the new year, we thought we would hold a little giveaway! When we were in Austin last September for the Handmade Nation premiere, we were lucky enough to each receive a Sublime Stitching Eco Tote. Since I really only need one of these, I thought I would kick off the new year with a little giveaway. I love this bag. It's nice and sturdy with plenty of room for all of your things! I've used it as a carry on, to carry shopping, clothing and the list goes on. The one that we are giving away is brand new. It has a Sublime Stitching Handmade Nation logo (image via Obsessive Consumption) ironed on which you can use as a guide to embroider the design on the bag. After you are done, run your bag in cold water and the special ink will wash right out. We will even throw in a Sublime Stitching pattern for you to embroider your own items. Drop an email to info(at)gotcraft(dot)com with the subject line "SS Giveaway" and we will announce a winner on Wednesday, January 6th, 2010.